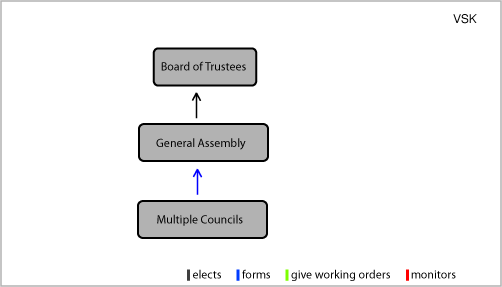 VSK works with a system where representatives of multiple councils sit in the general assembly. The maximum number of representatives is 25. Usually 15 are present. Every year, there are 6 meetings on Saturday and 2 weekend conferences. The total budget is around € 315,000. The main source of funds is the Ministry of Education. VSK also has some project-based funds. Members don’t have to contribute. Also, most activities organised are free of charge. VSK has 7 members of staff. There is a Secretary General and an administration/communication employee, two policy participation advisors, two local participation (support to student councils) advisors and one equal opportunities in education coordinator. School student councils were first formed during the 1970’s. In 1997 the Flemish student organisation organised a meeting with secondary school students. In 1998 the organisation was founded. The highest decision-making body is the general assembly. The GA convenes six times a year and also during two weekends. The daily affairs are managed by a board of trustees. This board consists of six students and an adult advisor. Additionally, there are volunteers and members of the staff. Flemish law recognised VSK officially in 2000 as an independent organ with its own finances. There is internal participation; students govern the organisation. No adults may have voting rights. In 2004 the participation decree became law. This made it compulsory for every school to have a student council. Also, a member of VSK sits on the Official Board of the Flemish Education (VLOR), an advising organ. In municipal bodies students are sometimes represented through a youth council. On a national level VSK is actively representing students.